Wouldn’t you like to know what’s going on in my mind? I suppose most theoretical physicists who (like me) are comfortably past the age of 60 worry about their susceptibility to “crazy-old-guy syndrome.” (Sorry for the sexism, but all the victims of this malady I know are guys.) It can be sad when a formerly great scientist falls far out of the mainstream and seems to be spouting nonsense. Matthew Fisher is only 55, but reluctance to be seen as a crazy old guy might partially explain why he has kept pretty quiet about his passionate pursuit of neuroscience over the past three years. That changed two months ago when he posted a paper on the arXiv about Quantum Cognition. Neuroscience has a very seductive pull, because it is at once very accessible and very inaccessible. 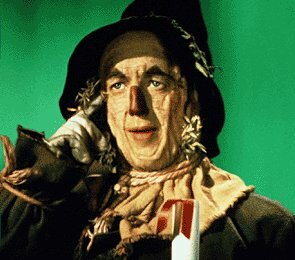 While a theoretical physicist might think and write about a brane even without having or seeing a brane, everybody’s got a brain (some scarecrows excepted). On the other hand, while it’s not too hard to write down and study the equations that describe a brane, it is not at all easy to write down the equations for a brain, let alone solve them. The brain is fascinating because we know so little about it. And … how can anyone with a healthy appreciation for Gödel’s Theorem not be intrigued by the very idea of a brain that thinks about itself? (Almost) everybody’s got a brain. The idea that quantum effects could have an important role in brain function is not new, but is routinely dismissed as wildly implausible. Matthew Fisher begs to differ. And those who read his paper (as I hope many will) are bound to conclude: This old guy’s not so crazy. He may be onto something. At least he’s raising some very interesting questions. My appreciation for Matthew and his paper was heightened further this Wednesday, when Matthew stopped by Caltech for a lunch-time seminar and one of my interminable dinner-time group meetings. I don’t know whether my brain is performing quantum information processing (and neither does Matthew), but just the thought that it might be is lighting me up like a zebrafish. Following Matthew, let’s take a deep breath and ask ourselves: What would need to be true for quantum information processing to be important in the brain? Presumably we would need ways to (1) store quantum information for a long time, (2) transport quantum information, (3) create entanglement, and (4) have entanglement influence the firing of neurons. After a three-year quest, Matthew has interesting things to say about all of these issues. For details, you should read the paper. Matthew argues that the only plausible repositories for quantum information in the brain are the Phosphorus-31 nuclear spins in phosphate ions. Because these nuclei are spin-1/2, they have no electric quadrupole moments and hence corresponding long coherence times — of order a second. That may not be long enough, but phosphate ions can be bound with calcium ions into objects called Posner clusters, each containing six P-31 nuclei. The phosphorus nuclei in Posner clusters might have coherence times greatly enhanced by motional narrowing, perhaps as long as weeks or even longer. Where energy is being consumed in a cell, ATP sometimes releases diphosphate ions (what biochemists call pyrophosphate), which are later broken into two separate phosphate ions, each with a single P-31 qubit. Matthew argues that the breakup of the diphosphate, catalyzed by a suitable enzyme, will occur at an enhanced rate when these two P-31 qubits are in a spin singlet rather than a spin triplet. The reason is that the enzyme has to grab ahold of the diphosphate molecule and stop its rotation in order to break it apart, which is much easier when the molecule has even rather than odd orbital angular momentum; therefore due to Fermi statistics the spin state of the P-31 nuclei must be antisymmetric. Thus wherever ATP is consumed there is a plentiful source of entangled qubit pairs. If the phosphate molecules remain unbound, this entanglement will decay in about a second, but it is a different story if the phosphate ions group together quickly enough into Posner clusters, allowing the entanglement to survive for a much longer time. If the two members of an entangled qubit pair are snatched up by different Posner clusters, the clusters may then be transported into different cells, distributing the entanglement over relatively long distances. What causes a neuron to fire is a complicated story that I won’t attempt to wade into. Suffice it to say that part of the story may involve the chemical binding of a pair of Posner clusters which then melt if the environment is sufficiently acidic, releasing calcium ions and phosphate ions which enhance the firing. The melting rate depends on the spin state of the six P-31 nuclei within the cluster, so that entanglement between clusters in different cells may induce nonlocal correlations among different neurons, which could be quite complex if entanglement is widely distributed. This scenario raises more questions than it answers, but these are definitely scientific questions inviting further investigation and experimental exploration. One thing that is far from clear at this stage is whether such quantum correlations among neurons (if they exist at all) would be easy to simulate with a classical computer. Even if that turns out to be so, these potential quantum effects involving many neurons could be fabulously interesting. IQIM’s mission is to reach for transformative quantum science, particularly approaches that take advantage of synergies between different fields of study. This topic certainly qualifies. * It’s going to be great fun to see where it leads. If you are a young and ambitious scientist, you may be contemplating the dilemma: Should I pursue quantum physics or neuroscience? Maybe, just maybe, the right answer is: Both. *Matthew is the only member of the IQIM faculty who is not a Caltech professor, though he once was. Beware global search and replace! I’m old enough to remember when cutting and pasting were really done with scissors and glue (or Scotch tape). When I was a graduate student in the late 1970s, few physicists typed their own papers, and if they did they left gaps in the text, to be filled in later with handwritten equations. The gold standard of technical typing was the IBM Correcting Selectric II typewriter. Among its innovations was the correction ribbon, which allowed one to remove a typo with the touch of a key. But it was especially important for scientists that the Selectric could type mathematical characters, including Greek letters. It wasn’t easy. 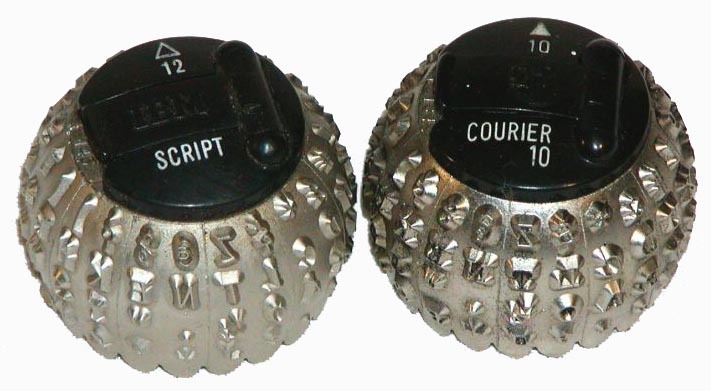 Many different typeballs were available, to support various fonts and special characters. Typing a displayed equation or in-line equation usually involved swapping back and forth between typeballs to access all the needed symbols. Most physics research groups had staff who knew how to use the IBM Selectric and spent much of their time typing manuscripts. Though the IBM Selectric was used by many groups, typewriters have unique personalities, as forensic scientists know. I had a friend who claimed he had learned to recognize telltale differences among documents produced by various IBM Selectric machines. That way, whenever he received a referee report, he could identify its place of origin. Manuscripts did not evolve through 23 typeset versions in those days, as one of my recent papers did. Editing was arduous and frustrating, particularly for a lowly graduate student like me, who needed to beg Blanche to set aside what she was doing for Steve Weinberg and devote a moment or two to working on my paper. It was tremendously liberating when I learned to use TeX in 1990 and started typing my own papers. (Not LaTeX in those days, but Plain TeX embellished by a macro for formatting.) That was a technological advance that definitely improved my productivity. An earlier generation had felt the same way about the Xerox machine. This was a revocable error. There must have been a way to undo it (though it was not immediately obvious how). Or I could have closed the file without saving, losing some recent edits but limiting the damage. But it was late at night and I was tired. I panicked, immediately saving and LaTeXing the file. It was a mess. Okay, no problem, all I had to do was replace every \vec x with x and everything would be fine. Except that in the original replacement I had neglected to specify “Match Case.” In 264 places $X$ had become $\vec x$, and the new replacement did not restore the capitalization. It took hours to restore every $X$ by hand, and there are probably a few more that I haven’t noticed yet. Which brings me to the cautionary tale of one of my former graduate students, Robert Navin. Rob’s thesis had two main topics, scattering off vortices and scattering off monopoles. On the night before the thesis due date, Rob made a horrifying discovery. The crux of his analysis of scattering off vortices concerned the singularity structure of a certain analytic function, and the chapter about vortices made many references to the poles of this function. What Rob realized at this late stage is that these singularities are actually branch points, not poles! What to do? It’s late and you’re tired and your thesis is due in a few hours. Aha! Global search and replace! Rob replaced every occurrence of “pole” in his thesis by “branch point.” Problem solved. Rob Navin no longer does physics, but has been very successful in finance. I’m sure he’s more careful now. 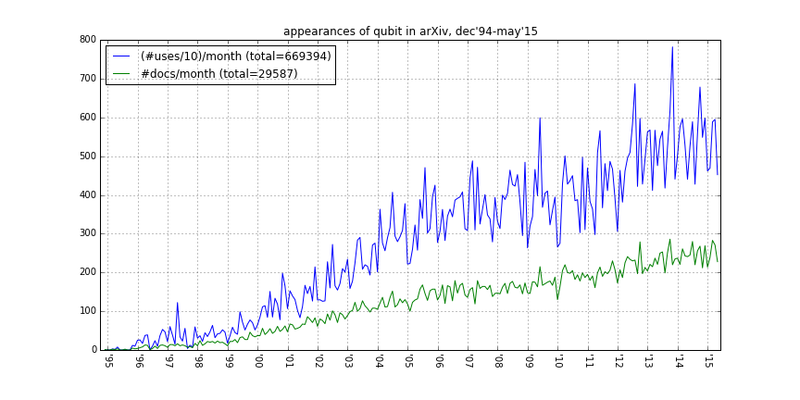 Editor’s Note: The preceding post on Quantum Frontiers inspired the always curious Paul Ginsparg to do some homework on usage of the word “qubit” in papers posted on the arXiv. Rather than paraphrase Paul’s observations I will quote his email verbatim, so you can experience its Ginspargian style. an impressive 669394 total in 29587 docs. only shows up in v2 of hep-th/9412048, posted in 2004.
theories apart"  of use of Feynman diagrams in post wwII period]. Perhaps because my 40th wedding anniversary is just a few weeks away, I have been thinking about anniversaries lately, which reminded me that we are celebrating the 20th anniversary of a number of milestones in quantum information science. In 1995 Cirac and Zoller proposed, and Wineland’s group first demonstrated, the ion trap quantum computer. Quantum error-correcting codes were invented by Shor and Steane, entanglement concentration and purification were described by Bennett et al., and there were many other fast-breaking developments. It was an exciting year. 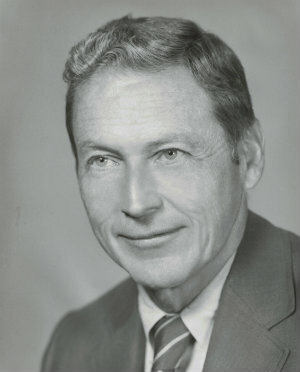 Ben Schumacher. Thanks for the qubits, Ben! The term “qubit” was coined in jest during one of the author’s many intriguing and valuable conversations with W. K. Wootters, and became the initial impetus for this work. I met Ben (and other luminaries of quantum information theory) for the first time at a summer school in Torino, Italy in 1996. After reading his papers my expectations were high, all the more so after Sam Braunstein warned me that I would be impressed: “Ben’s a good talker,” Sam assured me. I was not disappointed. A few years later Ben spent his sabbatical year at Caltech, which gave me an opportunity to compose a poem for the introduction to Ben’s (characteristically brilliant) talk at our physics colloquium. This poem does homage to that famous 1995 paper in which Ben not only introduced the word “qubit” but also explained how to compress a quantum state to the minimal number of qubits from which the original state can be recovered with a negligible loss of fidelity, thus formulating and proving the quantum version of Shannon’s famous source coding theorem, and laying the foundation for many subsequent developments in quantum information theory. Sometimes when I recite a poem I can sense the audience’s appreciation. But in this case there were only a few nervous titters. I was going for edgy but might have crossed the line into bizarre.. Since then I’ve (usually) tried to be more careful. This is a jubilee year. * In November 1964, John Bell submitted a paper to the obscure (and now defunct) journal Physics. That paper, entitled “On the Einstein Podolsky Rosen Paradox,” changed how we think about quantum physics. The paper was about quantum entanglement, the characteristic correlations among parts of a quantum system that are profoundly different than correlations in classical systems. Quantum entanglement had first been explicitly discussed in a 1935 paper by Einstein, Podolsky, and Rosen (hence Bell’s title). Later that same year, the essence of entanglement was nicely and succinctly captured by Schrödinger, who said, “the best possible knowledge of a whole does not necessarily include the best possible knowledge of its parts.” Schrödinger meant that even if we have the most complete knowledge Nature will allow about the state of a highly entangled quantum system, we are still powerless to predict what we’ll see if we look at a small part of the full system. Classical systems aren’t like that — if we know everything about the whole system then we know everything about all the parts as well. I think Schrödinger’s statement is still the best way to explain quantum entanglement in a single vigorous sentence. To Einstein, quantum entanglement was unsettling, indicating that something is missing from our understanding of the quantum world. Bell proposed thinking about quantum entanglement in a different way, not just as something weird and counter-intuitive, but as a resource that might be employed to perform useful tasks. Bell described a game that can be played by two parties, Alice and Bob. It is a cooperative game, meaning that Alice and Bob are both on the same side, trying to help one another win. In the game, Alice and Bob receive inputs from a referee, and they send outputs to the referee, winning if their outputs are correlated in a particular way which depends on the inputs they receive. Classical and quantum versions of Bell’s game. If Alice and Bob share entangled qubits rather than classical bits, then they can win the game with a higher success probability. There is also a quantum version of the game, in which the rules are the same except that Alice and Bob are now permitted to use entangled quantum bits (“qubits”) which were distributed before the game began. By exploiting their shared entanglement, they can play a better quantum strategy and win the game with a higher success probability, better than 85%. Thus quantum entanglement is a useful resource, enabling Alice and Bob to play the game better than if they shared only classical correlations instead of quantum correlations. And experimental physicists have been playing the game for decades, winning with a success probability that violates Bell’s inequality. The experiments indicate that quantum correlations really are fundamentally different than, and stronger than, classical correlations. Why is that such a big deal? Bell showed that a quantum system is more than just a probabilistic classical system, which eventually led to the realization (now widely believed though still not rigorously proven) that accurately predicting the behavior of highly entangled quantum systems is beyond the capacity of ordinary digital computers. Therefore physicists are now striving to scale up the weirdness of the microscopic world to larger and larger scales, eagerly seeking new phenomena and unprecedented technological capabilities. 1964 was a good year. Higgs and others described the Higgs mechanism, Gell-Mann and Zweig proposed the quark model, Penzias and Wilson discovered the cosmic microwave background, and I saw the Beatles on the Ed Sullivan show. Those developments continue to reverberate 50 years later. We’re still looking for evidence of new particle physics beyond the standard model, we’re still trying to unravel the large scale structure of the universe, and I still like listening to the Beatles. Bell’s legacy is that quantum entanglement is becoming an increasingly pervasive theme of contemporary physics, important not just as the source of a quantum computer’s awesome power, but also as a crucial feature of exotic quantum phases of matter, and even as a vital element of the quantum structure of spacetime itself. 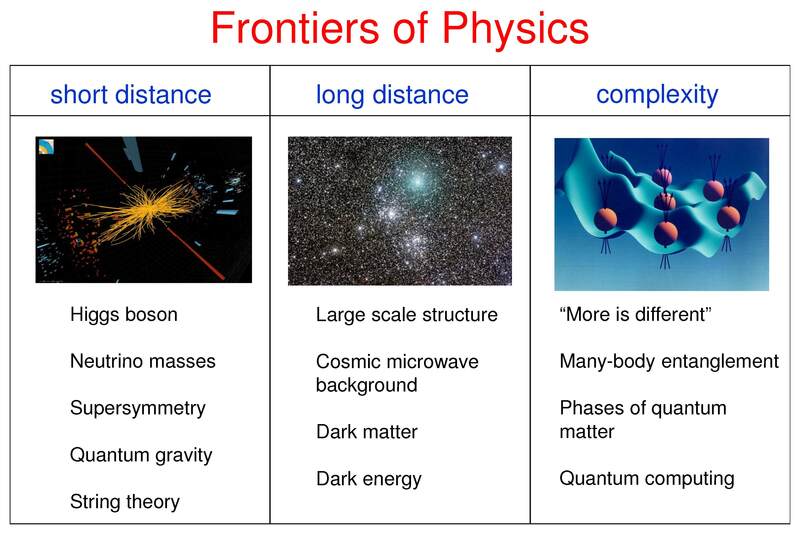 21st century physics will advance not only by probing the short-distance frontier of particle physics and the long-distance frontier of cosmology, but also by exploring the entanglement frontier, by elucidating and exploiting the properties of increasingly complex quantum states. Sometimes I wonder how the history of physics might have been different if there had been no John Bell. Without Higgs, Brout and Englert and others would have elucidated the spontaneous breakdown of gauge symmetry in 1964. Without Gell-Mann, Zweig could have formulated the quark model. Without Penzias and Wilson, Dicke and collaborators would have discovered the primordial black-body radiation at around the same time. **I’m abusing history somewhat. Bell did not use the language of games, and this particular version of the inequality, which has since been extensively tested in experiments, was derived by Clauser, Horne, Shimony, and Holt in 1969.